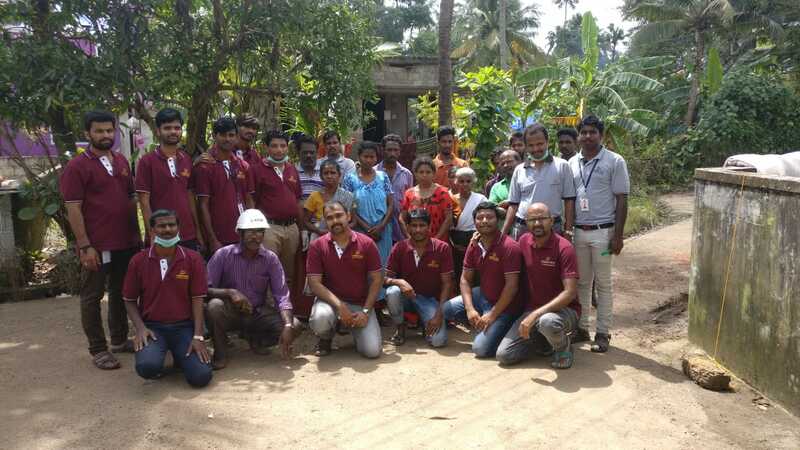 It all started when on 20th August 2018, Murugaraj received an email from his employees that they wanted to contribute one day’s salary towards flood survivors in Kerala. While watching the News over lunch. they saw that 56 people had died because of no electricity in hospitals in Kerala. This got them thinking. Instead of sending relief material, they decided to go and help on the ground using the expertise they have. Within 2 hours of taking this decision, they were on the way to Kerala. Their family members must be applauded thatwithout any hesitation they encouraged them to go. Murugaraj Swaminathan, with 3 of his friends, run a facility management company called “Uniservice”. They manage more than 40 communities, without compromising on the benefits to the employees and to the environment. The initial funding of Rs 1 Lakh was arranged from within their close friends. Since no other mode of transport was feasible, they went by road. There were several landslides and detours but in 13 hours, they reached the first village, Aluva. Through the Whitefield Rising network they got connected to the Executive Engineer at Aluva. The situation was really bad with8-9 feet water everywhere. What they saw put the team in a state of shock! They felt there is no way they could do anything in this condition and they decided to head back. At around 9:30 pm when they were nearing Thrissur they got a call from Thrissur Electricity board to help them. At 11:15 when they reached the office they were shocked to see the entire staff including the Chief Engineer working in all their capacity. Murugaraj had kept his team in Bengaluru on standby to come at short notice. By 7am the next day, a team of 22 Uniservice staff along with the material arrived in Thrissur. They quickly formed teams, each team with one Assistant Engineer, 4 electricians, 1 or 2 plumbers and 1or 2 pest control persons. They got into Jeeps and by 11am work started. First the pest control person entered the house as there were snakes in the fridge, in the cupboards, in the TV, anywhere at all. Forty to fifty people had died because of snake bites alone. The electricity board people had never faced anything like this in their lifetime. This is where Uniservice’s expertise came into help. The Electricity board (KSEB) officials were very helpful. They offered them food, accommodation and Jeeps to travel. They also gave full support in terms of clearance of documents, providing linesman and Assistant Engineers. By this time their work and efforts had gone viral and they were receiving 60-80 calls per day! Their day begin at 6:30 am and ended at 11 pm. They continued their mission for 5 days. Every night by 10pm they would sit and plan for the next day. The KSEB team was always there. Then next day morning teams were made and sent out. In all, they helped 12-14 villages in Thrissur and Ernakulum district. They also electrified 1 medical college, 2 government schools and one orphanage. Where they couldn’t reach, they shared a 7 step process that they had devised and documented. Here we must mention that while this team was working relentlessly in Kerala, there was a team in Bangalore supporting and tracking them. Communities like DNR Atmosphere, Bren Avilon, and Midtown apartments, where Uniservice does maintenance, offered to pull out all the staff needed from their premises and give them 5 day paid leave. 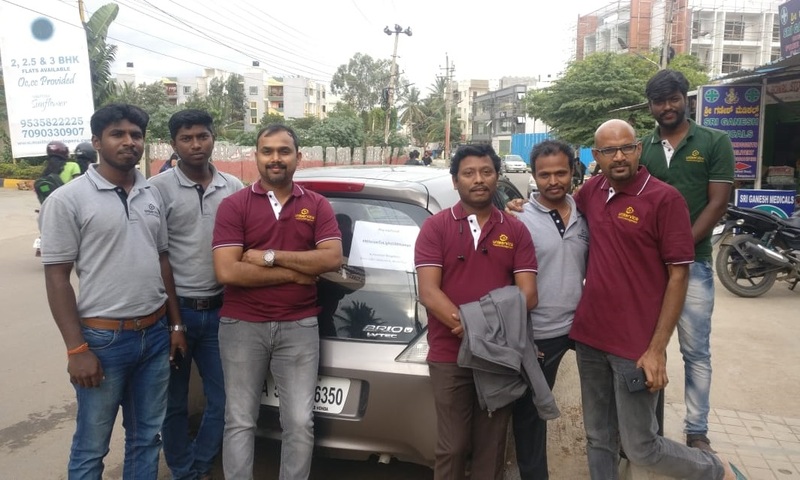 Murugaraj says that in his 14 years of corporate life he has not seen such team work, such dedication and such grit to accomplish what needed to be done. He says when one decides to do something good, help follows. For him the real success was when, without their presence, individual homes could fix their electricity by following the easy process they had setup. This was used by KSEB too! It is their dedication and love for doing what is right that transpired into something so remarkable that the Finance minister of Kerala actually picked up his phone at 9:30 pm one night to speak to Murugaraj. They are satisfied with the fact that many agencies, colleges and government officials are using their process to continue the electrification process. Three cheers to the dedicated team of Uniservice volunteers! May their tribe grow.